“Yes, we were delighted that Angela and Alastair were able to factor us into their trip south of the border. It was so good to see them again and hear, first hand, all the Fearnan and Fortingall news. We can’t believe that it is a full year since we moved in here. Sometimes it has been two steps forward, one step back (on occasions three steps!) as regards all the alterations and refurbishment, but we can honestly say that we now have a lovely home and garden. It was not too difficult to settle back into the area as we had lived in this part of the UK for many years prior to coming north, and we were able to take up with old friends again. The village of Charlton Horethorne is bigger than Fearnan. It still has a shop and a pub and the mobile post office van comes to the green three times a week, which is really handy. It is a very active village community with a hall where we can bowl, go to musical evenings (for all tastes), have parties and get-togethers, BBQs and, of course, a day in the calendar not to be missed – the annual village flower show. We have rejoined our old golf club, Sherborne, which is only 5 minutes away in the car, and occasionally are like ships that pass in the night, with all the matches and friendly games we’re asked to play. And Bob has found a new challenge too – outdoor lawn bowls. He plays in Sherborne and has taken to it like a duck to water. We are both very well as Angela and Alastair can testify. Although they were not with us long and they arrived in the middle of utter chaos with water everywhere (the soft furnisher had drilled through a central heating pipe in the sitting room!! ), we had a lovely time with them. We drove out to Cerne Abbas to see the Giant, a chalk figure dug out of the hillside centuries ago. Legend has it that if infertile couples spend the night on a certain and highly visible part of his anatomy, nine months later they will be blessed with the patter of tiny feet ….. ! I think this is self-explanatory! 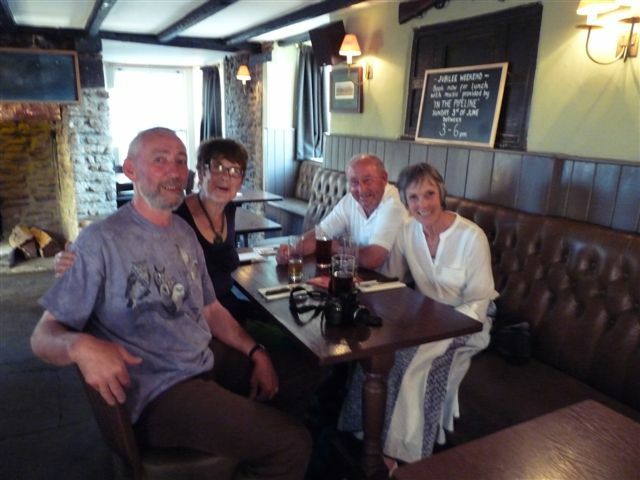 Their visit proved a very happy interlude indeed when we were able to enjoy the company of old friends as well as good food and wine. Writing this has conjured up many happy memories of our time in Fearnan, which we will never forget.